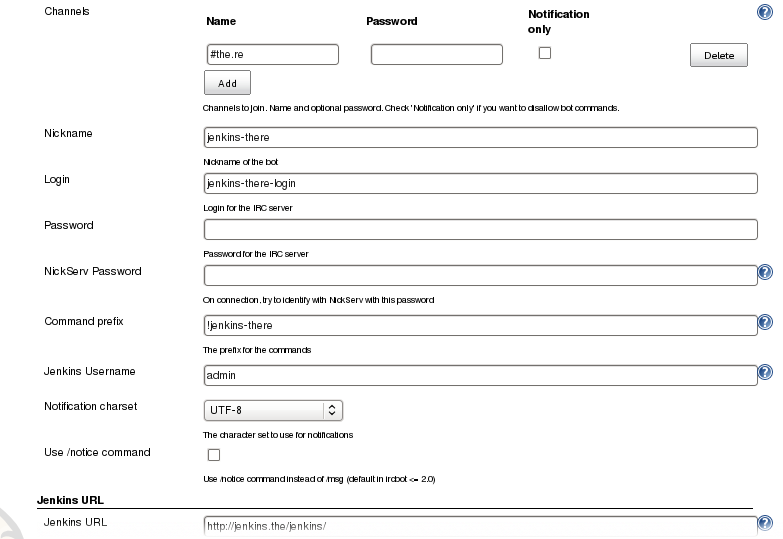 After booting from turnkeylinux jenkins ( which was importedinto the.re), the command turnkey-init is run to setup the password of the admin user of the web interface and allow administrative actions. The same password is used on every screen and all questions regarding the automatic upgrades are skipped. The the.re reverse proxy is configured for jenkins.the.re. It is installed on all the bare metal machines via puppet. 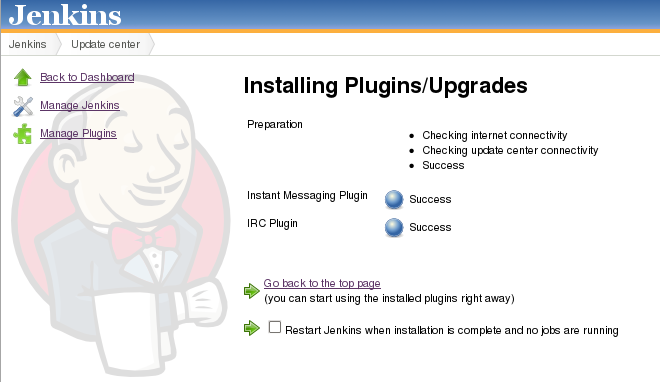 From the jenkins home page, click the Manage Plugins link. Click on the Available tab. Scroll down to IRC Plugin, click the checkbox and click Install without restart. After a few seconds the page shows success. Back to the home page, click on Configure System and scroll down to IRC Notification. Set the Hostname to irc.freenode.net, the Port to 6667, click the Add button, set the Name to #the.re and click the Advanced button. 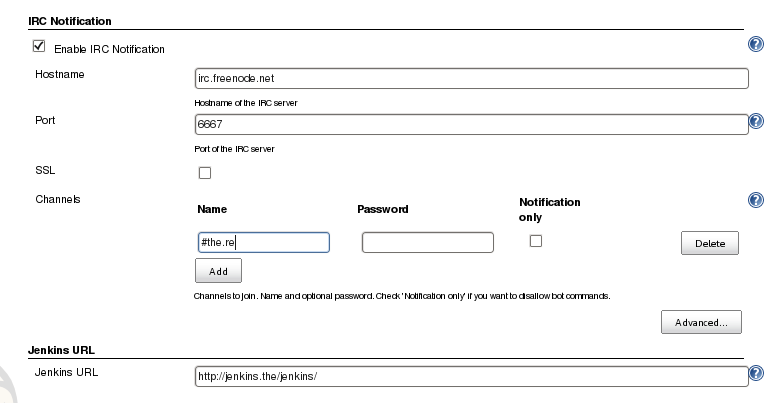 Set the Nickname to jenkins-there, the Login to jenkins-there-login (it must be different from the nickname otherwise it will silently fail), the Command prefix to !jenkins-there, the Jenkins Username to admin ( or any other jenkins user with enough permissions ). Go to the bottom of the page and click Save. 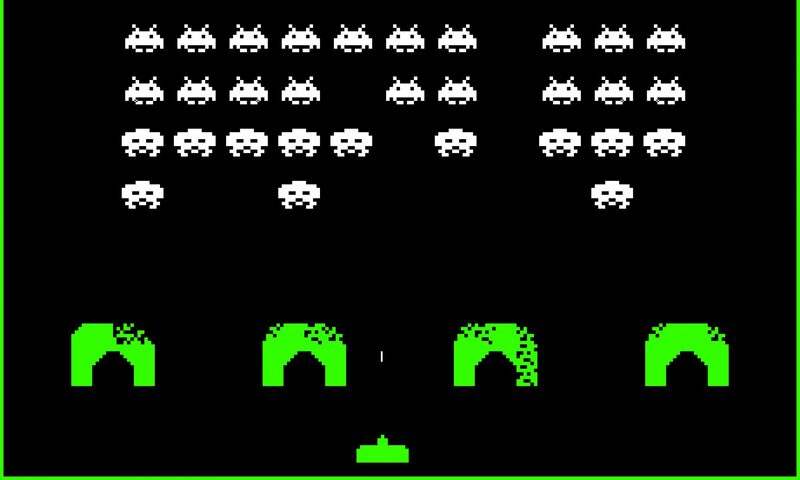 After a few seconds, the jenkins-there nickname shows up in the #the.re chat room. It will respond to the !jenkins-there help command with a list of available commands.